I am a psychologist, retired from the Faculty of the Department of Psychiatry at the University of Pittsburgh in 1988. I was born in Buffalo, NY in 1931, studied in the Music Department at Carnegie Institute of Technology (1949-51) and earned three degrees from Duquesne University: a B.A. in Music Education and an M.A. and Ph.D. in Psychology (1975). Since 1989, with my husband Gene, a retired physicist, I have been living six months each year in Jerusalem, Israel and the rest of the year in Pittsburgh, PA. In 2010, we moved our US base to Providence RI to be near one of Gene's sons and his family. This is a second marriage for each of us. Gene has three sons and eight grandchildren, all living in the USA. I have a daughter, a son, and eight Israeli grandchildren. My interest in psychology and family systems was sparked by a prolonged estrangement in my own family. After many years of study, preparation, failed efforts, and skilled guidance, the conflict was eventually resolved. 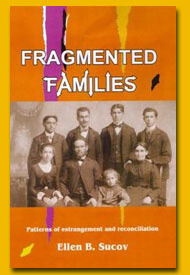 Fragmented Families is an outgrowth of that process.